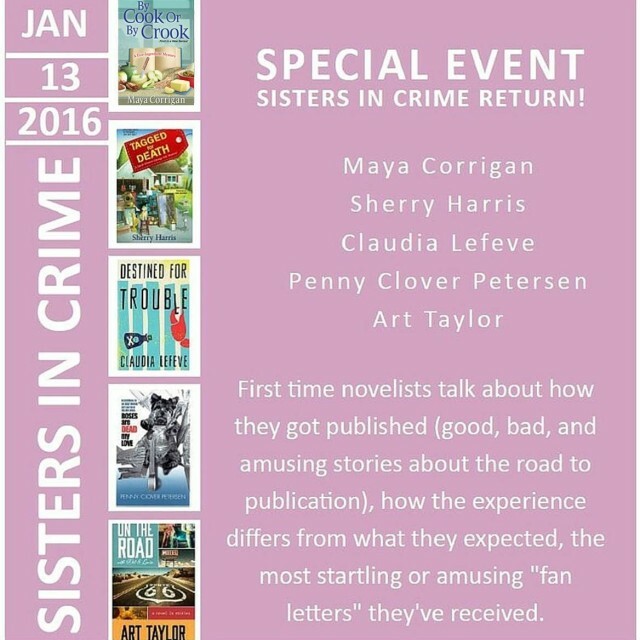 I’m pleased to be appearing this week with several local mystery writers—members of the Chesapeake Chapter of Sisters in Crime—at the Charles E. Beatley, Jr. Central Library at 5005 Duke Street, Alexandria, VA. The panel discussion will explore how we first-time novelists got our start, what’s been surprising about being a published author, and how we cultivate and interact with our readers. The program takes place on Wednesday, January 13, beginning at 7 p.m.
Maya Corrigan, author of the Five-Ingredient Mysteries, featuring a café manager and her grandfather, the Codger Cook, who solve murders in a historic town near the Chesapeake Bay. Sherry Harris, author of the Sarah Winston Garage Sale series, including Tagged for Death, a finalist for the Agatha Award for Best First Novel. Claudia LeFeve, author of Destined for Trouble, who draws inspiration for her books from her former career in law enforcement. Penny Clover Peterson, author of the Daisy & Rose Mystery Series, off-beat cozies including Roses and Daisies and Death, Oh My! and Roses Are Dead, My Love. I’ll be doing double-duty as a panelist and moderator. Hope to see folks there!